I don't normally cover the Country Music Awards, but this year there were a lot of great dresses. 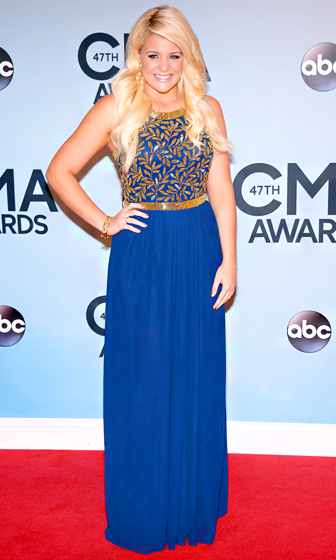 Miranda Lambert looks stunning in this cobalt Roberto Cavalli gown. Love her Farrah Fawcett hair, makeup and earrings. Taylor Swift is wearing a gown from Elie Saab's fall collection. I always love Taylor in red. The dress is bigger than I prefer, but she still looks great. I can't help but think of Christmas though. Lucy Hale is in a dress from Julien Macdonald's spring 2013 collection. She should have worn strappy heels, not platforms. BCBG Max Azria with a diamond cut-out on the back. It's not half bad, but is it right for a teen? Cassadee Pope is wearing a dress by Jovani. Carrie Underwood is wearing Ralph & Russo Couture. I like the top half of the dress. I hate dresses with sheer bottoms though and wish this trend would go away. Line it, or cut the bottom off and rock it short. Lauren Alaina is wearing Virgos Lounge. I like the colors, but not the shape and styling. Also, that's an unfortunate dye job. Sheryl Crow is rocking this Ralph Lauren dress. She has great shoulders, so it works. I'm not digging Faith Hill in Lanvin. This is Jana Kramer. I didn't know who she was, so I googled her. She's an actress and country singer who has two failed marriages under her belt that each lasted less than a year. She recently broke off her engagement with fellow country star Brantley Gilbert. The internet seems to paint a picture of a woman who is very unlucky in love. Well, guess who she's dating now... Clint Eastwood's hot son, Scott Eastwood. Enough of that, back to the fashion... Jana is wearing a dress from Theia's fall collection. Even though it has long sleeves and a billowing skirt, I kind of like it. It's pretty. Connie Britton looks ok in this Georges Hobeika dress. It's not my favorite, but it's not the worst either. Kimberly Perry of The Band Perry looks stunning. This Johanna Johnson dress is gorgeous. And I do love a cap sleeve! Colbie Caillat is wearing a mini dress from Nicole Miller. Something about this doesn't work for me. I think it's her hair. Kellie Pickler killed it in this Georges Chakra Couture gown. Love the shape. Love the jewels. Love the hair and makeup. Hayley Orrantia is in a colorful chiffon frock from House of Ronald. I'm not a fan of prints, but somehow this works. I love Miranda Lambert!!!!! And all of those dresses are just gorg!!!!!! I love Kellie Pickler's dress! I don't always love Miranda's choices but this dress is beautiful on her AND the color is great! Taylor looks beautiful but I'm a bit bored by this look, but you're right she does look GREAT in red, even if it seems too much like Christmas. I am waiting for an elf to jump out of her skirt! I love Lucy Hale's dress - maybe it's just the neckline but I dig it. I think that Danielle's dress is fine for a teen (depending on the back) It's high cut on the chest so i think it's good. It's very interesting. Cassedee Pope - agreed... over it. And I like her hair, sort of, but I'm pretty sure the blonde is extensions and they don't blend well... but that's just me being picky. Carrie Underwood - how I love me some Carrie. I love this dress but agree the sheer bottom is a bit much, and it's too damn long, how did she not trip all night? Homegirl has the BEST legs, she should NEVER hide them. Lauren Alania - this looks like something Miranda would usually get.. I don't like it. Sheryl Crow - Love the dress, hate the hair. What is the thing with that "WIND BLOWN STRAIGHT BACK" look, I hate it. Faith Hill ... no time for a face lift I'll just pull my hair back in a up do SUPER TIGHT! Not loving it either. PS She needs to feed her hubby a sandwich, he's wasting away, isn't that against Souther laws? Connie's dress - I like the neckline, it's unexpected with the peter pan like rhinestones. Kimberly Perry - oh how I love this woman's voice. She looks lovely. Kellie is a doll - I love this look. And the different cut of the top of her dress. Makes it interesting. Hayley - at first I didn't like this but the more I stare at it, I'm like... I think I do. I really don't know what Faith was thinking. That dress looks terrible on her. I'm not super impressed by anyone really. I like Kimberly Perry a lot. And yeah, Taylor looks like she's going to a Christmas ball.